Polish President Visits Jewish Center Amid Holocaust Dispute - Integration Through Media ....! 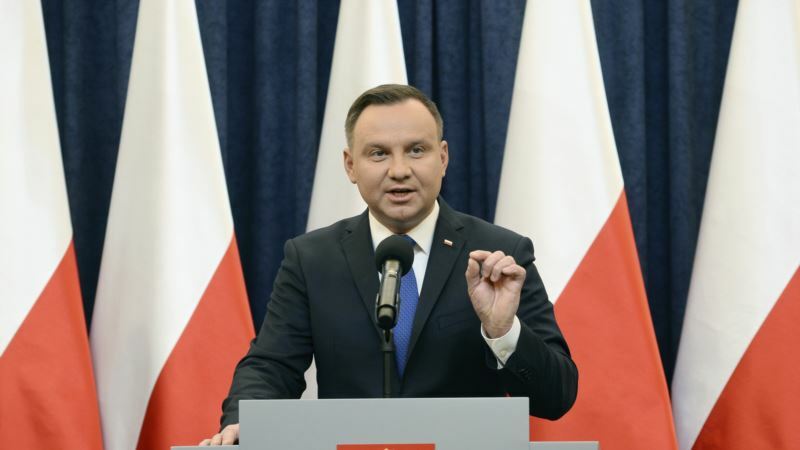 (VOA): Poland's president visited a Jewish community center Tuesday amid an upsurge of domestic anti-Semitism and international criticism of a new law that makes it a crime to blame Poland for the Holocaust crimes of Nazi Germany. In a conciliatory gesture, President Andrzej Duda visited the Jewish Community Center in Krakow, the southern Polish city that was home to a vibrant Jewish community before it was decimated during World War II. Elderly Holocaust survivors gather at the center, but it also houses a nursery and preschool – a reflection of the re-emergence of a Jewish population in Poland. During his visit, Duda stressed his appreciation for Jewish culture and its role in Poland. “Many people in Poland's culture, (like) wonderful poets with Jewish roots, had a great contribution to what we today call Poland,” Duda said. The new law, which allows prison sentences of up to three years for falsely attributing the Holocaust crimes of occupying German Nazis to Poles, has angered Israeli officials. Their vocal opposition sparked anti-Jewish remarks in Poland's public media by some right-wing commentators and elected officials. “Anti-Semitism must be fought on the social and on the state level,” Duda said at the center. Polish officials have said the law was needed to fight untrue statements about Poland's part as a state in the Holocaust. Critics in Israel say it could stifle research and have alleged it is an attempt to whitewash the wartime deeds of some Poles who turned against their Jewish neighbors. Duda expressed hope that the “dissonance, not a crisis” with Israel will be resolved. He said he thinks the bilateral relations laboriously built in the decades since Poland became a democracy won't suffer. “It is a heartache to think that anything of that could be lost,” Duda said. A team of Polish historians is traveling to Israel Wednesday to discuss the law. The Israeli and Polish prime ministers agreed in January that such a meeting could help reduce tensions over the law. “The purpose of the dialogue is preserving historical truth and preventing damage to freedom of research and speech,” the Israeli Foreign Ministry said.